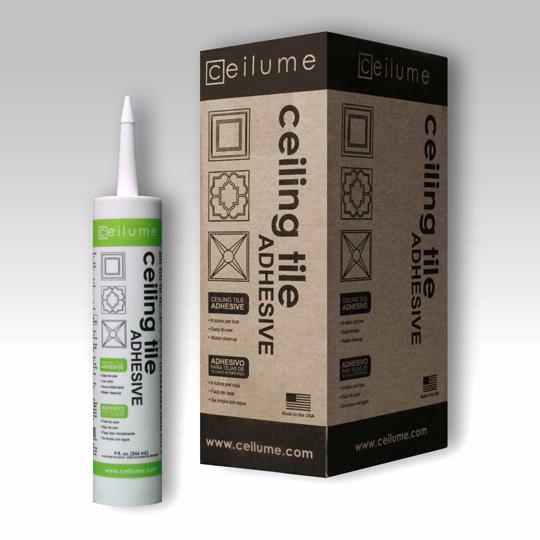 Formulated specifically for ceiling tiles, Ceilume's Ceiling Tile Adhesive gives you better adhesion, better coverage, and more confidence that you are using the right product for your job! Use with... vinyl, PVC, mineral fiber/acoustic, wood fiber, tin, and polystyrene ceiling tiles per the manufacturer's instructions. Not recommended for styrofoam tiles. Adheres to... sheetrock, wallboard, plywood, plaster, cement, and mineral fiber/acoustic tiles. Primed or painted surfaces preferred. How many 2x2 squares does one tub glue? Each tube should give you enough adhesive for 6 2'x2' ceiling tiles. Is moisture an issue? I am looking to put this in my kitchen and I want to make sure that this adhesive will stand up to any moisture from cooking, dishes, etc. Ceilume's glue-up ceiling tiles are unaffected by moisture and humidity. The adhesive itself should never be subjected to moisture as it will be covered and protected by the ceiling tiles. The small amount of humidity or moisture that may make its way beneath the tiles will not affect the performance of the adhesive. How do I estiimate how much glue I will need for my ceiling installation? I am planning on installing the Bentley Ceiling with decorative strips over seams and border tile. Room is 12.5 X 71.5. Each tube has enough adhesive for about 6 each 2'x2' tiles so each case should install approximately 36 full 2'x2' tiles. For the room dimensions you've provided (12.5' x 71.5') you will need a bare minimum of 225 ceiling tiles, 23 bundles of Decorative Strips, and 7 cases of adhesive. You should order a few extra ceiling tiles cuts and waste. Feel free to give us a call at 800-557-0654 to discuss your installation or request free full-sized samples prior to placing your order. How much glue do I order per case of ceiling tile/trim? Each tube has enough adhesive for about 6 each 2'x2' tiles so each case should install approximately 36 full 2'x2' tiles. Heat in excess of 120 degrees can cause this adhesive to release and the inside of your motor home could easily exceed that temperature on a hot day. We do not recommend using this adhesive for your motor home ceiling project.